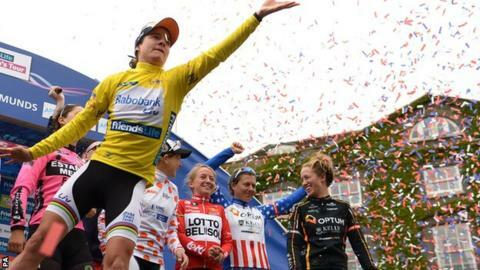 Organisers of the inaugural Women's Tour expect the event to continue and remain in the East of England. Olympic champion Marianne Vos won Britain's first multi-stage elite race for women, which went through Suffolk, Hertfordshire, Northamptonshire, Essex, Leicestershire and Bedfordshire. "I'm happy to say our expectations were exceeded," Hugh Roberts, chief executive of organisers SweetSpot, told BBC Radio Suffolk. "That augurs well for the future." The five-stage race, which started in Oundle and finished in Bury St Edmunds on Saturday, featured world champion Vos, as well as British medallists at London 2012 Laura Trott, Lizzie Armitstead and Dani King. It was the first UCI-ranked competition for women in Britain and, amid efforts to raise the profile and financing of female cycling, is expected to become an annual event. "It was always our intention to do that," said Roberts. "When you start an event for the first time, there is always some nervousness over whether it's going to meet expectations and capture imaginations. "I'm sure this will be a cornerstone of the sporting calendar from now on." Queen of the Mountains winner Sharon Laws said she hoped next year's course would feature more challenging hill sections. But the relatively flat terrain of the East region is expected to host the race in 2015. "If we had put on a very mountainous stage in the first year, it would have strained our resources somewhat," said Roberts. "If there are two or three miles between the front and back of the pack, it can cause logistical problems. "We deliberately kept a lid on it. While it would be fun to go into the Welsh mountains or the Peak District, it's only fair to remain loyal to our friends in the region for the foreseeable future."